Over the course of their long and happy marriage, the Fritzes became parents to four children, grandparents to 14, and great-grandparents to 15. They read in this newspaper about a young couple who planned to celebrate their July 1 wedding by going down the 1,000-foot water slide in downtown Cookeville. “We looked at each other and said, ‘Hey…maybe we should do that, too, to celebrate our anniversary’,” Jan said. Because closing several blocks of Broad Street on the first Sunday in July disrupts a handful of churches, including First United Methodist where Jan and Fran are faithful members, the city invites the congregations of those churches to slide during the Sunday School hour at a special rate. That made the plan even more perfect. Fran relies on an oxygen tank to help him breathe, so a friend offered to wait with the tank at the bottom of the slide. Another procured a “gator” to help the couple make it to the top of the hill and, when they were finished, to take them to where their towels and dry clothes were stashed. “We even got to cut line so we didn’t have to stand and wait,” Fran said. Once the ride was over, many Good Samaritans helped them exit the splash pool. That’s where I met up with them. I’d just secured my wristband and was on the hunt for a tube when I spotted Jan and Fran, sopping wet and looking just a little shook up. “That’s when the sharks began to gather,” Fran said with a laugh. Over the past few months, serious illness has landed Fran in the hospital several times. Jan has had a couple of health scares of her own. “There were times when we weren’t sure we’d live to see another wedding anniversary,” Jan told me. 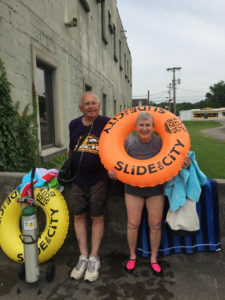 “That’s why we decided to go ahead and do this.” After emergency personnel stopped Fran’s bleeding and bandaged his arm, I asked the couple if they wanted to slide again, this time with me along to run interference. They both shook their heads.